Vendakka Mappas; the spicy Okra Masala curry is my special dish for Lunch today. When you hear the name Mappas, Karimeen Mappas and Beef Mappas Curry is what comes to your mind, right? Vendakka Mappas is equally tasty dish that can be enjoyed with rice or rotis. Once the lent season starts, all the vegetarian specials pop up automatically in most of the Christian homes, the long forgotten recipes will surface and it is vegetarian fiesta time!! It is really a hard time planning the menu, and trying to bring that extra zing to the meals to appease the adults and kids alike. I just love everything about the lent, and it is a time to plan the menu with the right combinations so you don’t detest the food and spoil the Great Spirit of the Lent Season but happily devour and enjoy all types of food. So, I take extra care while planning the menu. The menu needs to be tempting and fresh each day to keep up the interests, so I have a list of vegetarian dishes like Kadachakka Mappas, Cauliflower Mappas, Chana Masala, Brinjal Masala, Bhindi Masala, Aloo Gobi, Kadala Curry, Vegetable stew, Rajma curry, Potato Capsicum Masala, Potato stew, Dal curry etc. This Vendakka Mappas has been a favorite lent dish from my childhood.Stir fried Vendakka in rich spicy coconut milk gravy is definitely a wonderful treat. This is also one of the favorite dishes of my Achachi (my Father-in-law). Other Okra dishes like Vendakka Masala and Vendakka ularth are also delicious. Bhindi requires very less cooking time. Vendakka Mappas is a popular veg. 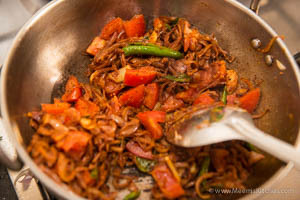 dish in Kerala and while some people use Vinegar, some use Tomato for tanginess. It goes well with rice as well as roti. 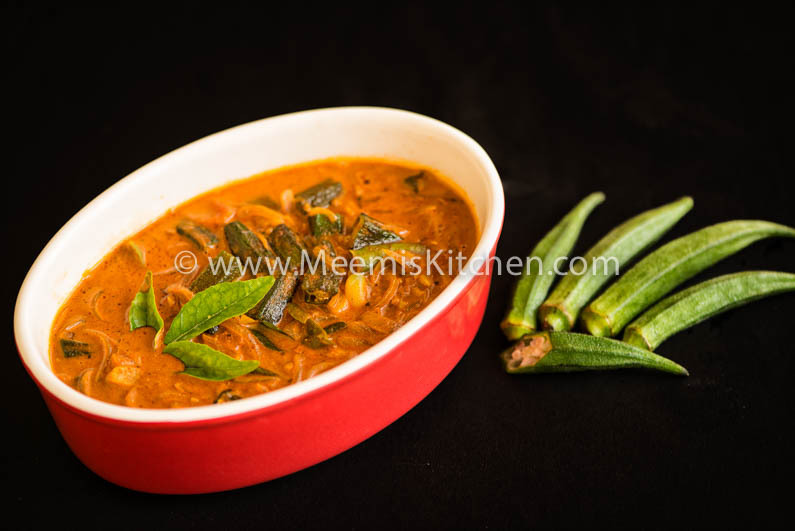 The stir fried Okra in rich spicy coconut gravy is extremely delicious and flavorsome. Do try this yummy Vendakka Mappas. Green Chili : 1 no. 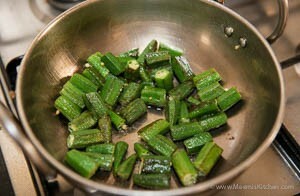 Wash and clean the Vendakka/ Okra/ Ladies Finger. Cut into small lengthy pieces. 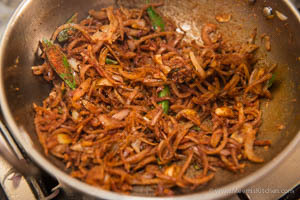 Heat oil in a pan, stir fry the Vendakka/ Okra with little salt, drain and keep aside. In the same pan, heat oil, pop mustards, curry leaves and after it crackles, add sliced onion, chopped ginger, garlic, slit green chilly and sauté well. 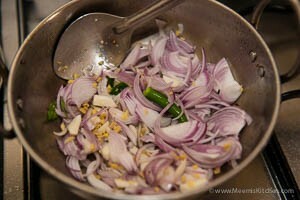 Once it becomes soft, add the masala powders and sauté for few minutes. Add the chopped tomatoes and sauté till it is mashed well. 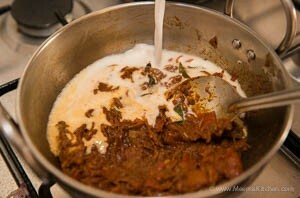 Add the coconut milk (skimmed / Randam Paal – 1 cup) and let it simmer. 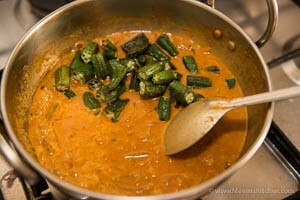 Add the stir fired Okra/ Vendakka to the gravy. Adjust the salt. Let it simmer for two minutes. Pour the thick Coconut milk and switch off the flame. Stir to combine well. The yummy Vendakka Mappas is ready. 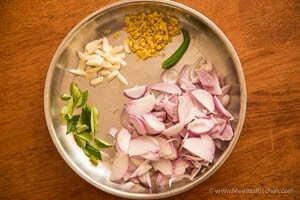 Serve it hot with rice or rotis. You can add ginger garlic paste (1 tsp) instead of chopped garlic/ ginger. 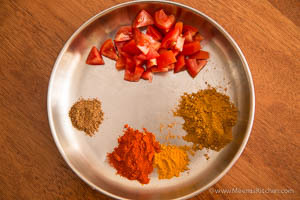 Adjust the spices as per your spice level. You can try adding vinegar instead of Tomato. Okra/ Lady’s Finger/ Vendakka are rich sources of dietary fiber, minerals, and vitamins; often recommended by nutritionists for cholesterol controlling and weight reducing benefits. It is one of the vegetables with highest levels of anti-oxidants. It is rich in flavonoids and helps to protect from lung and oral cavity cancers. It is an excellent source of vitamin-C and helps the body to develop immunity against infectious agents, reduce episodes of cold and cough and protect it from harmful free radicals. Please try it and let me know if you like it or share with your friends through the share buttons on the side. God Bless!! I tried this super easy curry and it came out well. Ladies finger and coconut milk is a match made in heaven. Thank you for sharing the recipe.